ADA Truncated Domes - Tile Tech Inc.
Truncated domes are also known as tactile paving, detectable warning surface, detectable warnings, or tactile ground surface indicators. It is a structure of textured ground surface indicators that may be found on several train station platforms, stairs, and footpaths, for the purpose of assisting pedestrians who are visually impaired or blind. Tactile warnings offer a distinguishing surface pattern of truncated domes, cones, or bars, which are detectable by foot or by a long cane. Such warnings are intended to alert individuals with visual impairments that they are approaching hazardous drop-offs or streets. Blind or visually impaired people are alerted of the approaching danger from a grade change or a vehicle impact. However, there is an argument between the community of users and the design community regarding the interior utility of such bars since it may present a tripping vulnerability. Initially used for dangerous vehicular roads and pedestrian crossings by countries such as Australia, Japan, and the United Kingdom, among others, America picked up this concept after the Americans with Disabilities Act was passed in the early 1990s. Canada first incorporated them in transportation in the 1990s, and then began building them in the environment in the early 2000s. In 1965, the original truncated domes was innovated by Seiichi Miyake. This type of paving was first commenced in Okayama City, Japan. Its functionality slowly spread throughout Japan, and then throughout the globe. Today, yellow truncated domes are almost omnipresent in Japan. For artistic purposes, such as in front of a hotel, its colour may be changed to reflect the stone floor or pavement’s colour. At times, the paving outlines are of steel dots and stripes. The use of truncated domes spread quickly when Japan National Railways adopted it. At present, it can be categorized into two kinds with different functions. The first kind entails round tiny bumps that are coordinated on the block’s surface, and intended to call attention through the soles of feet. The second kind is a block that illustrates a direction and is installed with slender and long bumps on the surface. On the other hand, several kinds have been produced and installed as an experiment. This situation not only produced confusion among visually impaired and blind people, but also among elderly people. Moreover, because the form with a different construction technique emerged, the misunderstandings further accelerated. From such issues having occurred, an analysis of standardization is performed in Japan. Due to the American Disabilities Act, Tile Tech has been involved with various agencies to design and manufacture a paver which would aid the visually impaired. These detectable warning pavers provide a series of raised truncated domes that are readily detectable underfoot, and by cane. Visualy impaired individuals depend on environmental cues, such as raised truncated domes, to inform of potential hazards. ambient sounds and physical elements that can be sensed by a cane or texture changes underfoot. 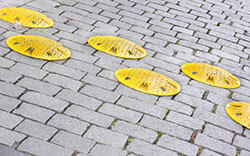 Any pedestrian area requiring the use of a detectable warning surface can utilize the Detectable Warning Pavers. The distinctively textured walking surface can help to warn pedestrians of an impending hazard on the route ahead. Manufactured in accordance with the current requirements set forth in the American Disabilities Act (ADA), that is, straight alignment of its truncated domes, The Detectable Warning Pavers are fabricated with a non-slip texture applied to the surface of the pavers. We manufacture our detectable warning pavers in several sizes and colors to suit various design requirements and conform to the ADA Code. Custom color and aggregate mixes are available upon special request at no additional cost.